Custom coil springs manufactured to meet a specific design made by the user to meet their mechanism’s requirements. Made to the dimensions the customer orders. 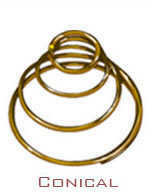 Coil springs made to order are also known as custom springs or specialty springs. 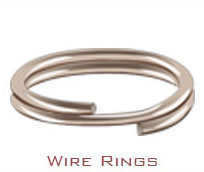 Acxess spring manufactures many types of coil springs made to order. The most basic coil springs are compression springs, extension springs, torsional springs, and conical springs This is why we have stock items of this kind. There are more complex coil spring types that will definitely need to be made to order. These custom springs include barrel springs, garter springs, magazine springs, non-linear dual pitch springs, and wire rings. Some of these are shown in the images to the right. We meet the needs of multiple industries by working with a wide range of both material types and wire diameter sizes; which are the what defines a spring company’s manufacturing capabilities. Not only are we able to manufacture springs for the medical or construction industries but we’re also able to help you design them based on the device’s requirements. For example, if you need a heavy duty spring with a three eighths wire that’ll be placed into a corrosive environment, we can definitely use 0.375” Stainless Steel 302 and begin your design from there. The same goes if you need a medical spring made to order with 0.007” wire and Stainless Steel 316 (which is a much cleaner material type). Other spring devices may require custom alterations like bends or legs which aren’t “included” in the “normal/usual” manufacturing of these springs. In the case of a compression spring, you may request that it has dual pitch, different diameters, or a certain bend on the ends for installation. These are custom compression springs which you will not be able to find in stock ANYWHERE. In this case you may email us a specific drawing showing all of these requirements with precise measurements or mail us a sample so that we may do an exact replica. Remember, we will make the springs to order so if your measurements aren’t accurate on the drawing, they might also not be accurate once they come off the machine. In the case of an extension or torsion spring, the custom accommodations some customers prefer involve certain specialty bends or loops on the legs (for a torsion springs) or hooks (for an extension springs). Some torsion springs might even have some pitch in between the coils; turning this spring into a torsional compression springs which will produce both a rotational “torque” and a linear (up and down) force. Other springs don’t necessarily need to have custom alterations to the design to be made custom. These springs are the more complex designs which were mentioned earlier. 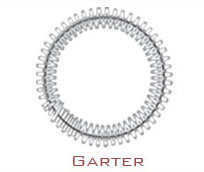 Garter springs, for example, not only have different sizes and dimensions, they also have different types of connectors. Magazine springs aren’t circular coil springs but oval/rectangular coil springs. Dual pitch springs have different amounts of pitch on different areas.